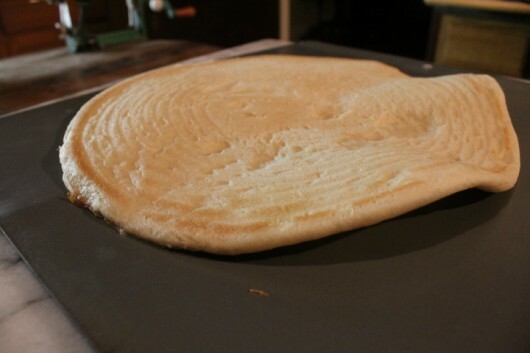 Now, if you know how to make a very thin pizza crust that won’t sag when you hold a slice horizontally (as above), then by all means make that crust. Otherwise, do what I did, and purchase a pre-formed, pre-baked crust from the supermarket. On a gluten-free diet? I’ve tried a few pre-formed, pre-baked, gluten-free crusts, and found them to be absolutely delicious. You can find these at better supermarkets and health-food stores. And cut it into 1/8-inch slices. And turn it into 1 1/2-inch-long sticks. I forgot to take a solo picture of the sticks. But you’ll see them in an ensemble cast in a moment. 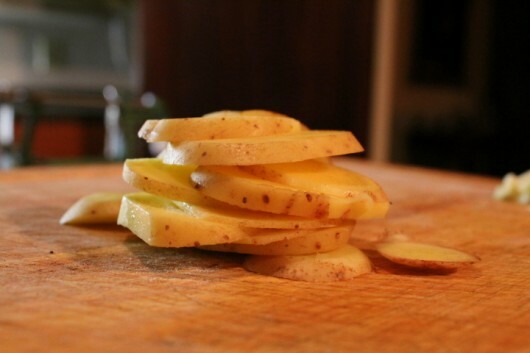 and cut them into 1/8-inch slices. 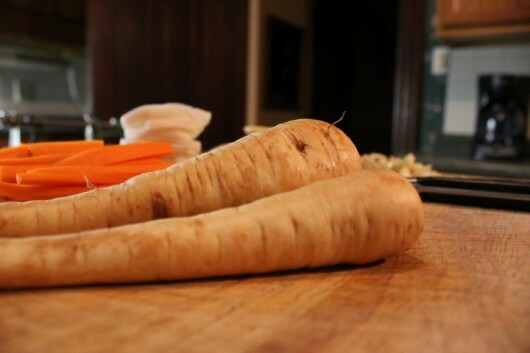 And here’s a tip: When you slice long veggies like carrots or parsnips, always slice them on the diagonal, or “bias.” Why? 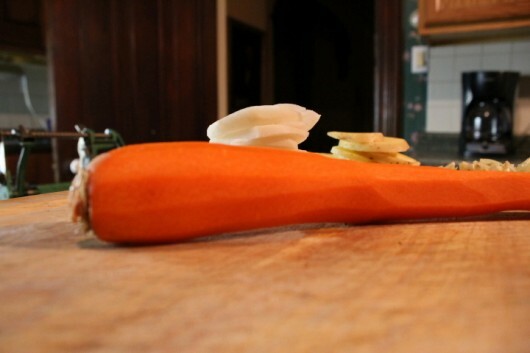 Because if you slice them straight down, the pieces will bounce off your cutting board, and land on the floor. That’s why. 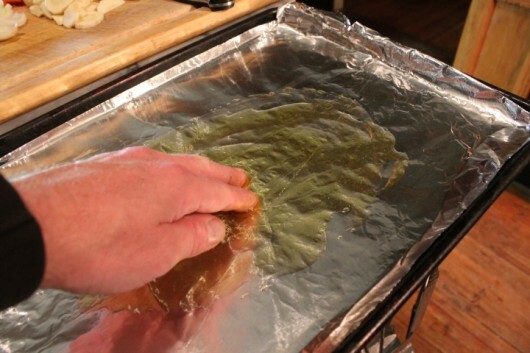 Now pour a glug of olive oil onto a rimmed baking sheet, and spread it around with your hand. Is your baking sheet too gross not to cover with aluminum foil? Then by all means cover it with aluminum foil. Dump the root vegetables onto the baking sheet, drizzled them with more olive oil, plus a big pinch of salt, and several grinds of black pepper. Toss until all are glistening with oil. Set the baking sheet in the preheated 450 degree F. oven. Toss the veggies every 10 minutes, until they are definitely tender and lightly caramelized. Total cooking time will be 20-30 minutes. While the veggies roast, dice up 2 fat cloves of garlic. Place the crust on a rimless baking sheet. 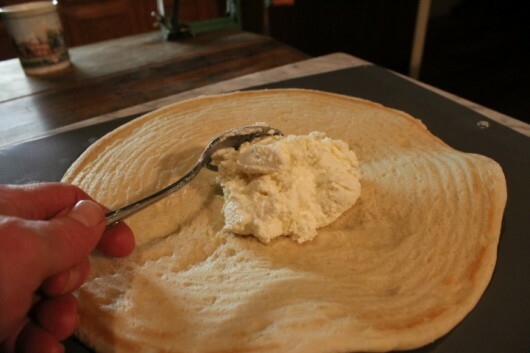 If you don’t have such a sheet, place the crust on a regular sheet that you’ve turned upside down. 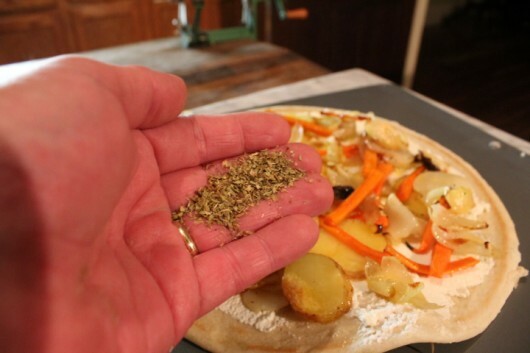 You simply need a smooth surface with which to slide the pizza into the oven. This will all make sense to you in a moment. I hope. 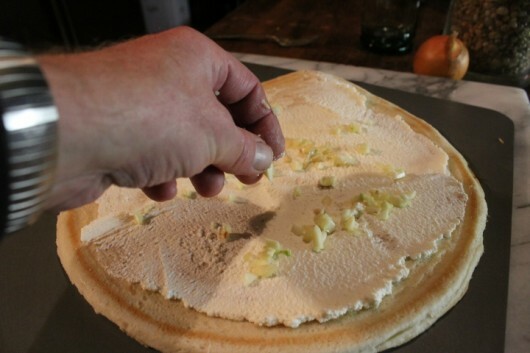 And then, preferably with an off-set spatula, spread the cheese to within one inch of crust’s edge. 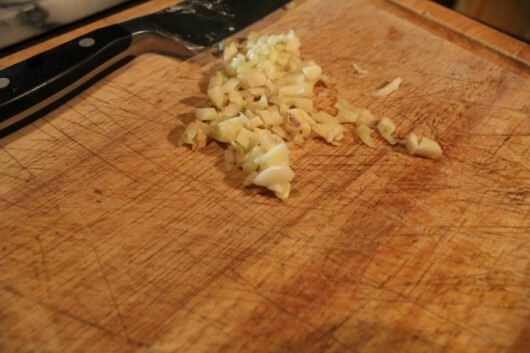 Remember the garlic we diced? Sprinkle it over the ricotta. 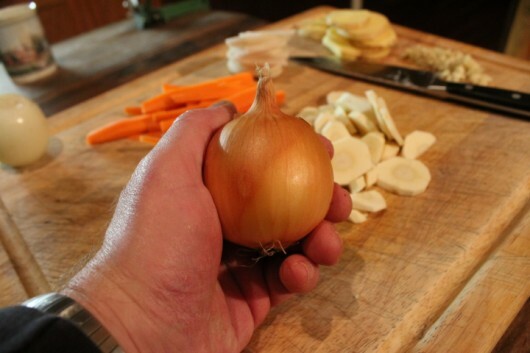 And by the way, here’s the reason we didn’t roast the garlic with the rest of the vegetables. Garlic cooked at a high temperature burns very rapidly. And burned garlic is bitter garlic. By adding raw diced cloves to the ricotta, we will get a gorgeous, garlicky kick with every bite of our pizza. And some shredded Asiago cheese. 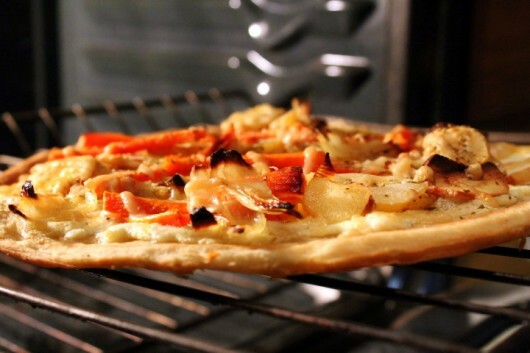 Lower the oven temperature to 425 degrees F., and then carry the pizza — still on its rimless tray — to the oven. No picture for this next step, because it is a two-handed operation: Slide the pizza onto the lower-middle rack of the hot oven. Bake until the crust begins to color, and the cheese melts — about 10 minutes. 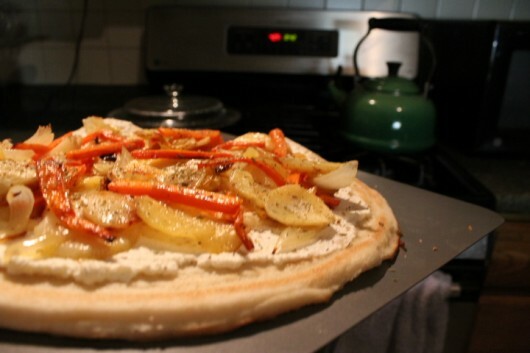 Then slide the pizza back onto your rimless baking sheet, and finally, onto your cutting board. 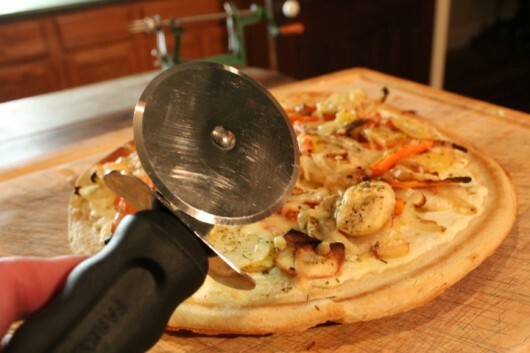 Slice, with your pastry cutter, the pizza in half. 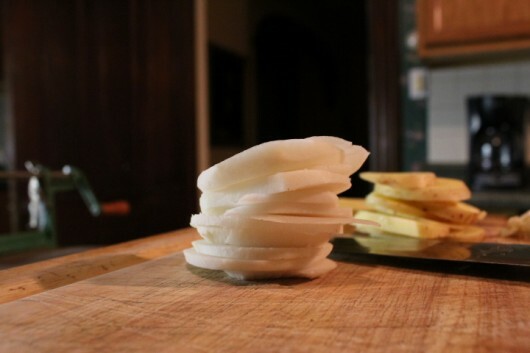 Then slice each half in half to make quarters. If you wish, you can slice the quarters in half to make eighths. 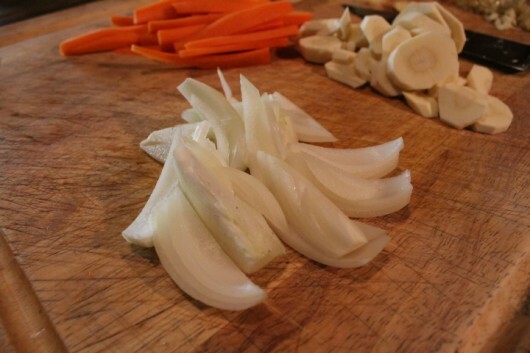 I didn’t understand fractions (like quarters, eighths, and sixteenths) until I started to cook. How about you? Notice how a slice of this pizza doesn’t sag when it is held horizontally? 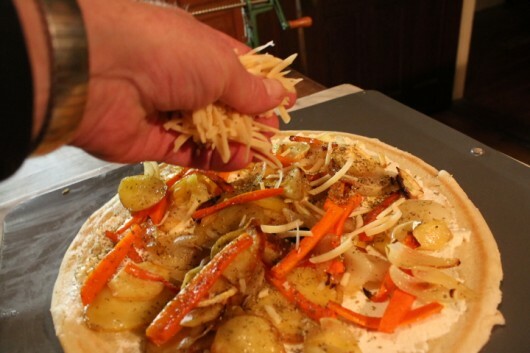 That’s the benefit of using a thin crust which was pre-baked before any toppings were added. And what a slice it is! The crust is so crisp that it crackles when you bite into it. And every bite offers a hit of creamy ricotta, fresh garlic, and naturally sweet-tasting, caramelized vegetables. Promise me you’ll try this pizza some day. Set oven rack at the lower-third position; preheat oven to 450 degrees F.
Pour a glug of olive oil onto the baking sheet, and spread it around to coat the entire sheet. 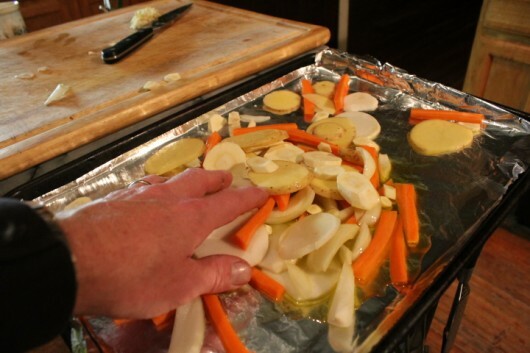 Pour all root vegetables except the garlic onto the baking sheet. Pour on another glug of olive oil, a big pinch of salt, several grinds of black pepper, and then toss, with your hands, until all veggies are coated. Set the baking sheet in the preheated 450 degree F. oven. Toss the veggies every 10 minutes, until they are definitely tender and lightly caramelized. Total cooking time will be 20-30 minutes. Meanwhile, set the crust on the rimless baking sheet. 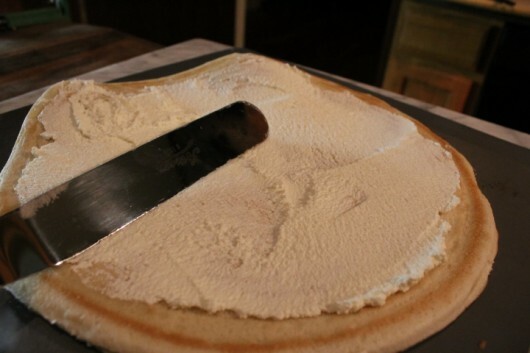 Scoop the ricotta cheese onto the center of the crust, and then spread it out (an offset spatula is useful here) to within one inch of crust’s edge. Sprinkle the diced garlic over the ricotta. 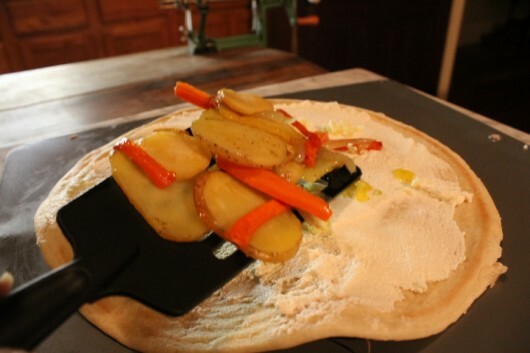 Distribute the roasted vegetables evenly over the crust. Lower the oven temperature to 425 degrees F. Slide the pizza onto the oven rack (still in the lower-third position), and bake until the crust begins to color and the cheese melts — about 10 minutes. Slice and serve at once. 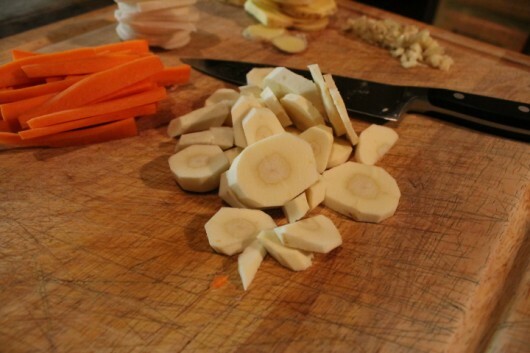 You know, I had always wanted to try to grow some turnips and parsnips… or for the most part, more root veggies! This might be a nice appetizer for Thanksgiving… I like to try out interesting recipes for my mother [who also complains why I didn’t cook like this when I was living at home.] Hee hee hee. I must try this! I have come to prefer a pizza without the usual red sauce. My dog, Jack, loves cheese also. It seems he can hear the package come out of the refrigerator no matter where he is or how deep a sleep he is in:) And he gives me that same look. 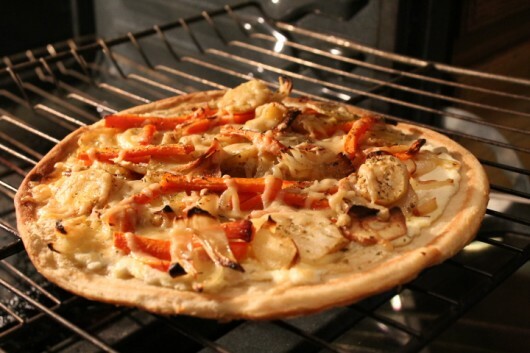 Hi Donna – Well, if you need an excuse to grow more root veggies, this pizza is definitely it! Terry – I agree with you — who needs tomato sauce? Great to hear about your dog Jack. Sounds like he’s as big a dairy queen as Lily the Beagle. I grew all of those root vegies this year and plan to roast them for our Thanksgiving meal. Now I know what to do with the leftovers. Thank you! I would have never thought of doing this. Thanks for the idea and recipe. 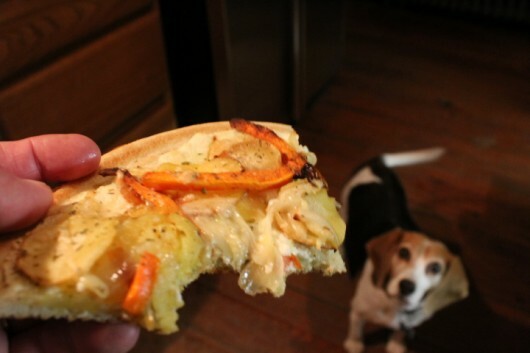 I grew rutabagas,potatoes and parsnips;that’s what is going on my pizza. Also hopefully homemade ricotta. Baileys has a caramel flavor and that is slated for the next pumpkin pie. Right now the fruitcake fruit is soaking in it. Thanks for all the great ideas! Sounds great! But, why peel the roots when there are so much nutrients in the skin? Anyway, I intend on doing this one and also would cook the veggies over a fire to get a smoky flavor to them using a fruit wood, maybe plum wood. Wood fire the pizza over oak. With a mesclun salad , a bottle of Pinot Noir and some Honey Lavender ice cream for desert. this is the perfect autumn meal! I had planned a get together with a gardener neighbor, this will make a nice luncheon. The store- bought pizza crust is such a good idea, the Holiday season is so hectic, anything to make like easier in the kitchen. Hi Oriane – Well, Lily started her career as a sous-chef. Now I’ve promoted her to taste-tester. Oh, how she wagged her tail at this promotion. Mesclun greens, Pinot Noir and a finish of Lavender ice cream? Amen! After looking at those pictures, this is what we are having today! I can’t wait! Thanks so much Kevin….. 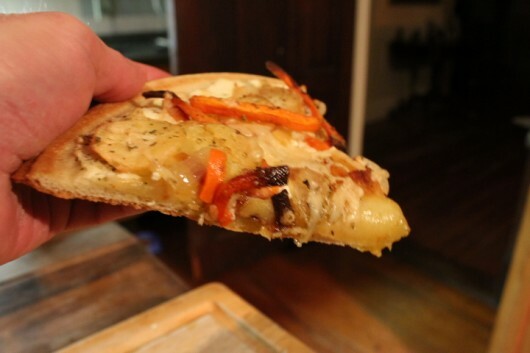 I roasted extra veggies on Thanksgiving and made this pizza on Friday. However, I never got to taste it because everyone else gobbled it up (no pun intended) before I could get my apron off! It must be fantastic; I will have to make it again soon. you could put that on top of your baked Naan bread, which I make now (thank you) and love, and if you think I love it… you should see my husband light up when I make it! It was to DIE FOR!!!! Kate – What a testament to this pizza’s deliciousness. Now go make one for yourself. And don’t share it. Deborah Morrison – I need to make Naan again. Thanks for the reminder! 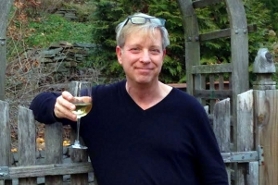 S. Taylor – Thanks for the link…now I want to visit St. Louis. That sounds heavenly! And? I totally recognize the look on Lily the Beagle’s face. Dotti the Pointer and Lucky the Catahoula Leopard Dog are both members of the same cheese fan club. 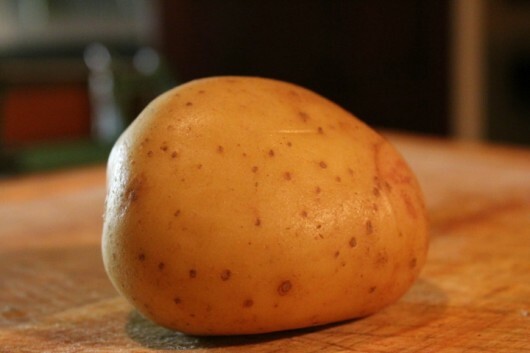 30 years ago potato’s on pie was new and trendy. Leave off the turnip and you can still use sauce, but ricotta was the norm. Try a layer of spinach cooked with garlic and oil (not Canola crap oil), between ricotta and the spuds. Gail – So glad you liked the pie! 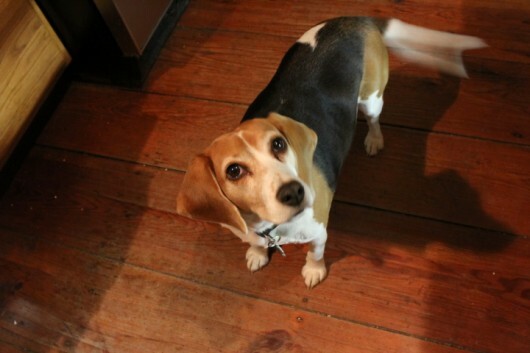 Lori – Lily the Beagle sends her cheese-y regards to both Dotti and Lucky. chris – Oh, does that sound delicious. Looks and sounds delicious! I’m going to try that next weekend! Thank you for sharing! 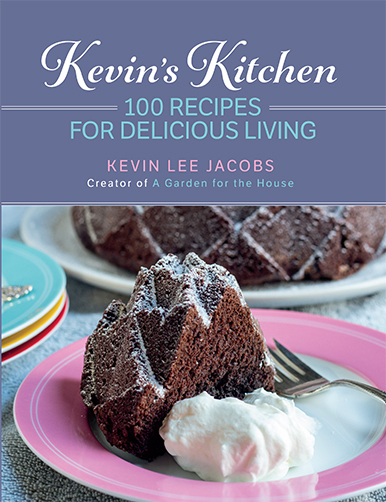 Kevin, I’ve had this recipe in my “make someday” pile for almost a year. Last night, I made it for my book group. What a hit it was! Everyone asked for the recipe and the group finished off every last piece. I will be pointing them here! I make this kind of pie all the time. Again, another thing we have in common. My way works for me. I slice up small portobella shrooms, Onions, Red bell peppers, a 1/4 C of crumbled crispy bacon, some baby spinach and throw them into a microwaveable dish with EVOO just to moisten, garlic powder, my favorite herbs, either fresh or dried from your garden. Cover the dish and nuke for 2-3 min stirring twice until steamed soft. Then I crisp the plain crust in a 400 degree oven. Oh man, we cannot stop making this! This is the first time I’m sad that spring is coming as it means fewer root veggies!! 😉 This is so incredibly yummy! Mixed pesto into the ricotta, added spinach to the pizza. LOVED IT!! 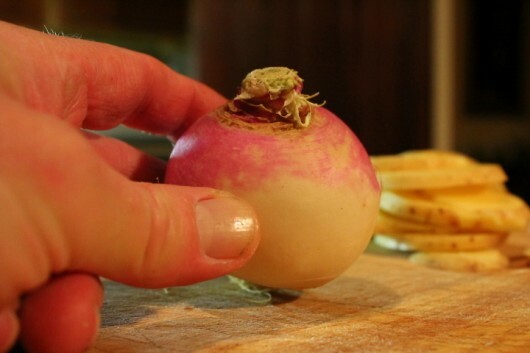 I’ve never eaten a turnip before so this was a great intro. My man was not too keen on it so that means more for me!